I love KFC! I’m referring to Korean Fried Chicken, not Kentucy Fried Chicken (even though I will find it hard to say no to that too). Kko Kko Nara Korean Restaurant on Tras Street (Tanjong Pagar) is a mom-and-pop chicken place that has been around for a while. They are famous for their Korean Fried Chicken, and the best part is they operate till late night 4am. For those of you who are always on the lookout for new supper place in Singapore — how about some Korean Fried Chicken and soju? 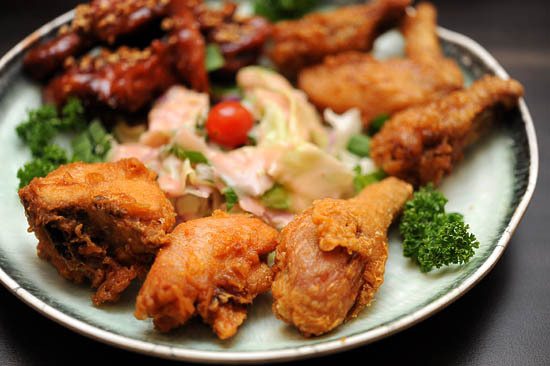 The Korean Fried Chicken craze actually took over New York City back in early 2007, but in Singapore, the term “Korean Fried Chicken” has not generated as much interest as KOI or Gong Cha Bubble tea. Who cares if nobody knows about Korean Fried Chicken? I’m glad that there are a couple Korean Restaurants in Singapore serving them, and the best thing is: there’s no need to queue up. After settling down, I was delighted to hear Koreans chatting in their native language. It’s always a good sign to see that the Korean Restaurant has the stamp of approval from their own people. We started with the pickled daikon, a very good appetiser to wake the palate. Like Togi Korean Restaurant, Kko Kko Nara only serves 6 side dishes: kimchi, potato, black lotus root, and beansprout. My favourite place for Korean food in Singapore: Kim’s Family Restaurant is still the best, with 10 side dishes and a whole fish! 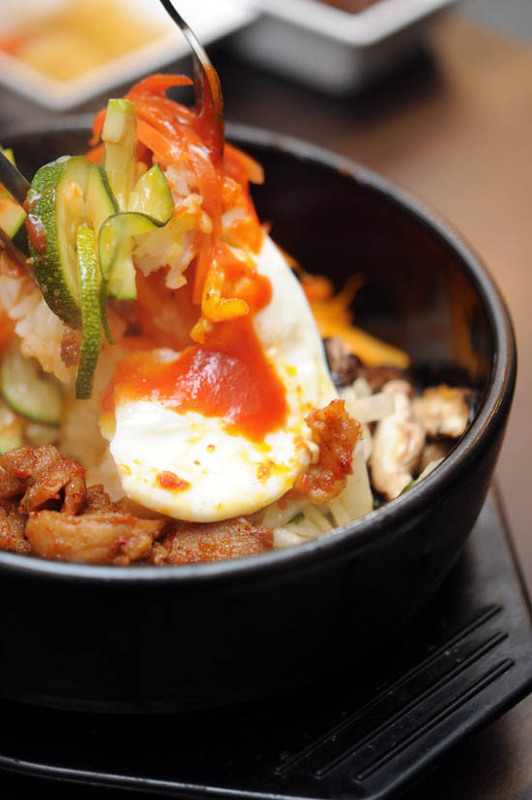 The Stone Pot Bibimbap ($10) came first. What’s there not to like about it? Add in the hot chilli sauce, and mix everything together in the hot stone pot — this is a must-order Korean food whenever I eat at Korean Restaurants. 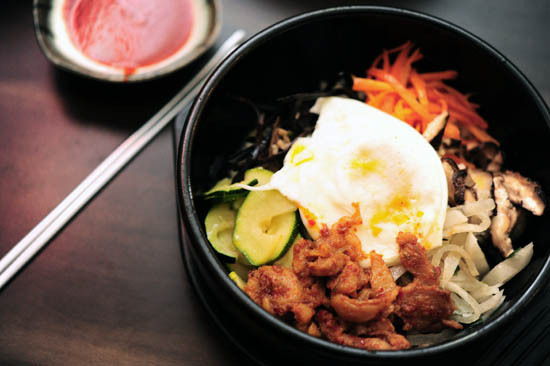 FYI: Kko Kko Nara only serves Bibimbap for lunch, it’s not available during dinner. I’ll touch on this in a while. 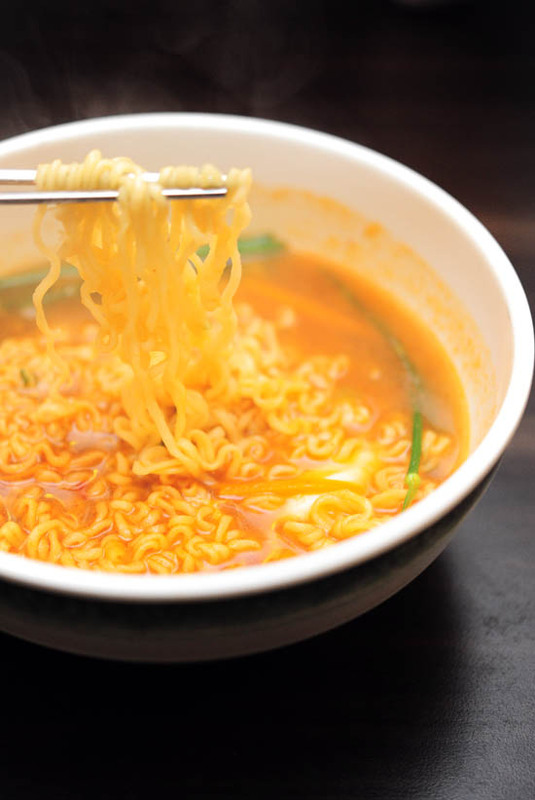 My friend wanted to try the Spicy Korean Ramen ($7), the stock was average, nothing to shout about. It’s also available for lunch only. And finally, Korean Fried Chicken (KFC)! Kko Kko Nara’s Korean Fried Chicken comes in four different flavours: original, soy garlic sauce, sweet & spicy, and hot & spicy. Since it was our first time there, we decided to go for the Small Chicken Combo Set ($20) which comes with 3pc of original, sweet & garlic. For those who prefer to have just a particular flavour, the Korean Fried Chicken is $15 for half and $25 for whole during lunch time (different pricing for dinner). What’s so special about Korean Fried Chicken? From what I understand, the chicken pieces are lightly coated with flour and deep-fried twice till a gorgeous shade of golden brown with shattering crisp. I tried the original flavour first, it was like normal deep-fried chicken, only leaner and crispier without any fats. Seriously, I could eat a dozen of the chicken wings on my own. I proceeded with the sweetish Soy Garlic sauce chicken wings which had more depth in flavour and taste. It was a right decision to leave Kko Kko Nara’s Sweet & Spicy KFC for the last, the spiciness only hit you after a while. I started to sweat, but I didn’t stop eating. They were awesome – Awesome with a capital A! Is KFC the best fried chicken in Singapore? I don’t know about others, but I preferred Korean Fried Chicken to the ‘best chicken wings’ that I had at No. 5 Emerald Hill. If you are keen to try out Kko Kko Nara korean restaurant for the Korean Fried Chicken, I’d advise you to go during lunch. The same chicken wings cost $5 more during dinner, and the ‘cheaper’ main dishes like Bibibamp, Bulgogi are not available at night. Unless you just want the fried chicken wings, the other main courses for dinner are in the $20-$40 range. I’m guessing that the premium is probably to cover their cost for opening till late night. But like what I have mentioned, Kko Kko Nara at Tras Street (Tanjong Pagar) is a great supper place for some drinks and Korean Fried Chicken. 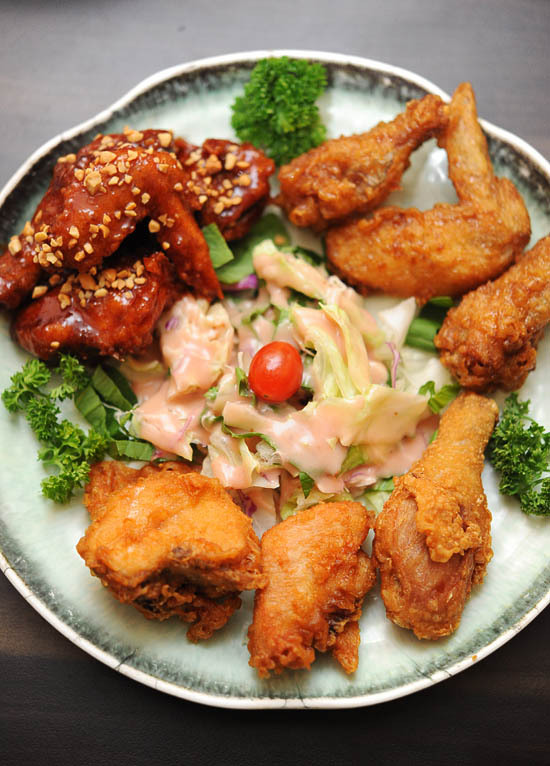 I’m gonna try the Korean Fried Chicken from Woori Nara Korean Restaurant at Lorong Kilat next. KFC FTW! // Recommended: lunch for the working crowd in Tanjong Pagar, and late night supper. I’m so happy you’re covering more Korean restaurants! Can hardly wait to read more on your discoveries! I tried Popeye Fried Chicken at Novena Sqaure a few weeks ago. They were slightly better than those from Kentucky Fried Chicken but nothing to shout about either. Wow that beats Kentucky Fried Chicken any day! Koreans know how to make fried chicken. I have 3 or 4 fried chicken places within moments of my apartment. I have had to learn resistance!! Just wanted to ask you whether you have to pay for the sides. We went there recently and the service was terrible so we didn’t bother to ask the waiters/waitresses regarding the side dishes. We were guided to sit at a table for 4 but was informed rudely to shift our seats to a smaller table although it was not crowded on a Sunday evening. We were served by a China man and a China lady who slammed the food on the table. Hair was spotted in the soup. Very bad experience although I will give thumbs up for the taste of the food. ivy: Nope the sides are free. Ya i know what you mean, the service is quite bad, but the food is good (especially the Korean Fried Chicken). Will you go back again for it? I went to this place just last night and the steamboat (or rather, ‘streamboat’ as indicated in the menu) was awesome! portion was perfect for 2 pax; $25 for the smaller size. If I remember correctly, it should be around $30 for the bigger one. The chicken wings were screaming out for me, but I didnt order it in the end as it was quite ex I find ( $25). Also, it was too much for the 2 small sized us. I have to agree with the service part though; it was quite bad. Took me quite some time to place an order but the real nightmare came after that. We waited for 20 mins (or more) for our food! There was practically no staff within sight. I had to walk to the counter all the way in front just to check when the food would arrive. The waiters/waitresses were mainly china folks. We asked for the bill and ironically, this took real fast. This is by far the best Korean Fried Chicken in Singapore, though it can’t be compared to those that I had @ Jeju. The rice cake hotpot is a must try as well, it’s really siok!!! Thought the staff are all korean, but that’s few months ago.